In conjunction with the winter Synergy publication featuring the work of FFI and its partner Missouri Children’s Division, the National Council of Juvenile and Family Court Judges’s Resource Center on Domestic Violence: Child Protection and Custody is hosting a webinar this week on Wednesday, May 18th, at 3pm EST. It is free to attend and the registration is open now! See the full webinar description and registration link below. In 2014, Missouri Children’s Division began a system transformation to improve outcomes. A key strategy is considering not just safety but wellbeing from the first contact with a family. To support this effort, the agency has adopted the Five Domains of Wellbeing as the foundation of its philosophy and practice. 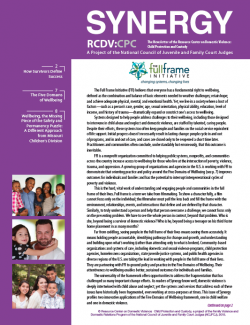 On this webinar, the Director of Missouri Children’s Division and the CEO of the Full Frame Initiative will offer an overview of the Five Domains of Wellbeing framework, provide examples of how it is being applied in Missouri’s child welfare system, share preliminary observations and findings, as well as plans for the future, and discuss implications of this shift for families, workers, and partner agencies. The webinar will also include a discussion of the key factors in making the Children’s Division/Full Frame Initiative partnership robust, productive, and sustainable. If you haven’t already, be sure to download the Synergy Winter, 2016 issue to read the related article “Wellbeing, the Missing Piece of the Safety and Permanency Puzzle: A New Approach from Children’s Division,” as well as other articles featuring FFI and our partners. For more information or questions, please contact Alicia Lord at alord@ncjfcj.org. We are growing and FFI is on the lookout for our next amazing team members! FFI is experiencing increased demand for our work around the country, so we are again growing our team to support, shape and enhance our purpose. We are excited to announce four new open opportunities to join us and become part of a high impact social change organization that is working to increase access to wellbeing. The open positions are Administrative Assistant, HR Generalist and two Training and Capacity Building Managers. Find out more and read the full job descriptions here! The hunt is on for passionate, dedicated new talent to add to our already amazing team! Deadline to apply is May 30.